By embracing the left instead of running to the center, New Jersey's Democratic Governor Jon Corzine has revitalized his once-troubled re-election campaign. Three months ago, before the August town hall meetings, Glenn Beck’s “fifteen minutes” or any of the other developments that have so unsettled Democrats, New Jersey Governor Jon Corzine was the party’s dead man walking. Struggling to get a grip on deficits, spiking unemployment and general economic turmoil, the former Goldman Sachs CEO couldn’t catch a break. Well into the 2009 off-year election season, when New Jersey and Virginia elect governors and send signals about the political zeitgeist, Corzine was feeling the fallout of his failed romance with an ex-state employees union president. Then came the July arrests of forty-four Garden State mayors, local officials, legislators and community leaders–most of them Democrats–on charges of corruption and money laundering. Corzine wasn’t linked to the wrongdoing, but that didn’t stop his GOP challenger, former federal prosecutor Chris Christie, from exploiting the scandal. Christie’s lead climbed to double digits, with one survey giving him a twenty-three-point advantage. Democratic strategists talked about replacing Corzine to avoid a defeat that would be noted by national pundits as both parties are furiously positioning for the critical 2010 Congressional and gubernatorial election season. Now, however, as the November 3 vote approaches, Corzine is running even or slightly ahead in polls, as Christie bleeds support among moderate suburbanites to independent Chris Daggett, a former GOP official whose fiscally conservative, socially moderate message recalls former GOP governors Tom Kean and Christine Todd Whitman in a way that Christie–who has been playing to the religious right–does not. The New Jersey race is starting to look like a bright spot for Democrats, who are well aware that even if “all politics is local,” the off-year election results will be spun as a win or a loss for Barack Obama–especially for the president’s initiatives in areas like healthcare reform. 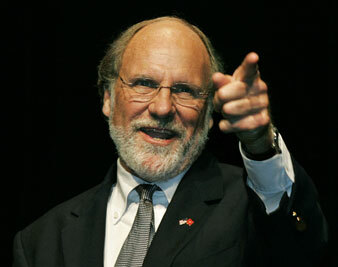 What did Corzine do? Instead of steering to the center, or the Blue Dog right, he turned left. Looking to rally Democratic voters, he patched up shaky relations with the state’s unions and linked his campaign so closely to the president that his billboards now feature images of Obama and Corzine. He ditched plans to pick an insider as his running mate, instead selecting State Senator Loretta Weinberg; this 74-year-old reformer has battled the bosses, championed open government and earned marks as the legislature’s progressive champion of civil rights, gay rights and consumer protection. And as Congressional Democrats wavered on the issue, Corzine made healthcare reform a focus of his campaign, emphasizing his fierce objections to Christie’s plan to lift state mandates requiring insurance companies to cover mammograms, pap tests, autism testing for children and forty-eight-hour hospital stays after birth. Christie said he wanted to ease mandates to reduce costs and make insurance more available. But Corzine’s support among women spiked when a pull-no-punches advertising campaign, lavishly funded by the wealthy governor (and not above taking cheap shots regarding Christie’s weight problems), highlighted devastating videos of the Republican nominee dismissing a breast cancer survivor’s heartfelt concern about the danger of eliminating the mammogram mandate. Corzine offers Democrats something more than the potential to spin a result, however. There are important lessons to be learned from his campaign, particularly about energizing the labor and liberal base and highlighting the human side of the healthcare debate. If he can keep a significant number of swing voters, especially women, in the Democratic column, Corzine will win this year. And savvy Democrats will have a strategy to study as they prepare for next year’s contests.